Closing out last season on the highest note of their career was the goal Lubov Ilyushechkina and Dylan Moscovitch had strived for all year. A sixth-place result at the 2017 World Championships — one spot higher than the season before — came on the heels of four international podium finishes: silver at Nebelhorn Trophy and bronze at Skate Canada, Cup of China and Four Continents. The duo’s placement in Helsinki — combined with the seventh-place finish of their teammates Meagan Duhamel and Eric Radford — guaranteed Canada three pairs berths at the 2018 Olympic Winter Games. “There was definitely an awareness heading into Worlds that we needed to earn those three spots, but we also knew going in that we had three strong teams,” Moscovitch said. Pairs was one of the most-talked about disciplines last season with the upswing in choreography, and Ilyushechkina and Moscovitch are very aware that — technically and artistically — it took a quantum leap forward. They want to be part of that conversation this season. “All the events are getting stronger. Everyone around the world is pushing the envelope, and everyone is getting better. Not just at the top, but all the way down,” said Moscovitch, 32. “In pairs it is a very strong field right now, which is pretty incredible. If we had done the season before what we did this year, we might have been a couple of places higher. Even just making it to the long program was a lot harder than it was last year. Ilyushechkina and Moscovitch were hard at work over the summer preparing for the most important season of their career. 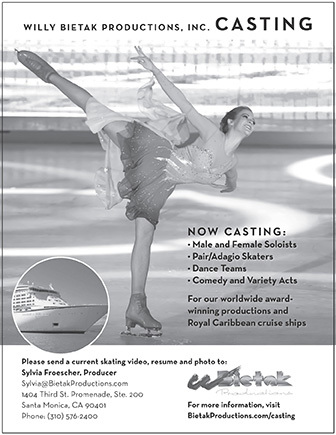 They kept the same team of choreographers as last season: Marie-France Dubreuil and David Wilson crafted the short program, while Wilson and Sandra Bezic designed the free. The short program is set to Phil Collins “In the Air Tonight,” and the long to “At This Moment,” a bluesy rock ballad by Billy Vera & the Beaters. Both programs have vocals. “Every year we try to do something different — a new style and a new direction and we try to do something we have never done before. This year is not an exception,” said Ilyushechkina, 25. Ilyushechkina said while there is a little bit of added pressure as they prepare for the new season, she considers it a positive thing. Coach Lee Barkell is keeping them grounded as they head into the new season and “is reminding us that we have to be calm and keep working hard,” she said. Ilyushechkina and Moscovitch opened the season at Thornhill Summer Skate in mid-August and placed fourth at their second event, Finlandia Trophy. The lineups at their two Grand Prix assignments — Canada and France — boast top-heavy pairs fields. Duhamel and Radford and the reigning World silver medalists from Germany, Aliona Savchenko and Bruno Massot, are also slated to compete at Skate Canada. Both know they will be in a battle for a podium finish at the Canadian Championships next January with a number of teams all vying to earn one of the three coveted berths to the 2018 Olympic Winter Games. Moscovitch said “it is a strong field for Canada, which is what you want. Everyone will be pushing hard to land on that podium and I think that whoever gets there will be better off heading into the Games because of that. For Ilyushechkina, who obtained Canadian citizenship in late September, it will be her first Olympic adventure. “Dylan talks about it a lot — how excited he was going to Sochi (in 2014) and gives me advice about how to keep myself from not being overwhelmed about the prospect of going there,” she said.